Stone’s lawyers said Monday investigators have yet to reach out. In the waning weeks of 2018, longtime GOP operative Roger Stone told reporters he believed he could be indicted and become the next target of special counsel Robert Mueller's probe into Russian meddling in the 2016 U.S. presidential election, and proclaimed his innocence. "I've said it's entirely possible I would be framed," Stone told ABC News, in his typically irreverent fashion, during a mid-December interview. And as the calendar turned to a new year, the once-steady stream of Stone's past associates and acquaintances visiting Mueller's D.C. offices has largely dried up. Stone's lawyers said Monday investigators have yet to reach out. He remains in a legal limbo: investigated but not charged. Asked to comment on the current state of play in the Mueller probe, Stone told ABC News, "No Russian collusion, no WikiLeaks collaboration and no perjury -- no crime." Nobody outside the special counsel's office could say whether an indictment of the political showman –- who parlayed his early support of a Trump presidential bid into a Netflix documentary -- remains imminent, or whether it's been stalled or derailed. Legal experts said several recent developments in the Mueller probe suggest he's not off the hook. "In terms of where and what and when, I think most logical indications are that the government has collected pretty much all the information and evidence they're going to have with respect to making charging decisions about Roger Stone," Kendall Coffey, a former U.S. attorney for the Southern District of Florida now in private practice, told ABC News on Monday. Stone has long been under scrutiny over his alleged contact with WikiLeaks publisher Julian Assange in the summer of 2016. Stone has told ABC News multiple times that he had never met or spoken with Assange and had no intermediary providing a back channel to communicate with him. Speculation that Stone could be a target of the Mueller probe intensified when he confirmed to ABC News that he was the unnamed Trump campaign insider who corresponded with Russian hackers, as described in special counsel Mueller's July 13 indictment against a dozen Russian intelligence officers who were posing as hackers, Guccifer 2.0. The indictment alleges that the 12 Russians engaged in a sustained effort to hack Democrats and aides to Clinton during the 2016 presidential campaign. Stone has dismissed his short Twitter direct message communications with Guccifer 2.0 as innocuous, denying knowledge that Russian agents were behind the account. There seems to be little doubt the Mueller team has had an interest in Stone's activities. 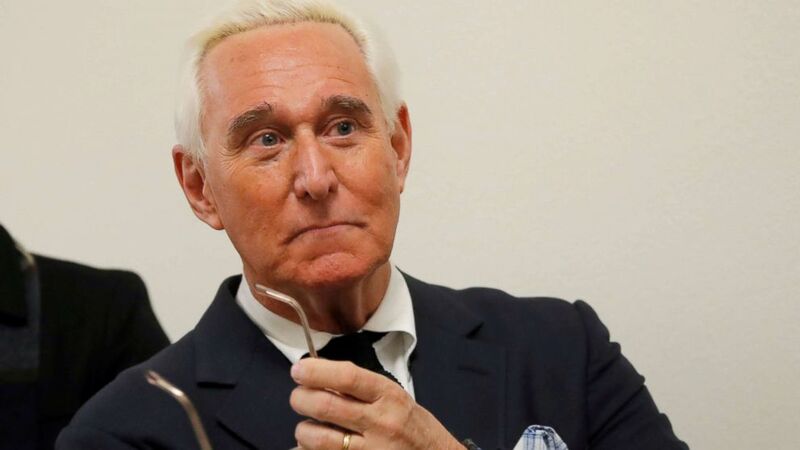 To date, at least 13 individuals associated with Stone have been contacted by the special counsel, and many of them have testified before a federal grand jury, according to a running tally compiled by ABC News from source interviews and courthouse sightings. 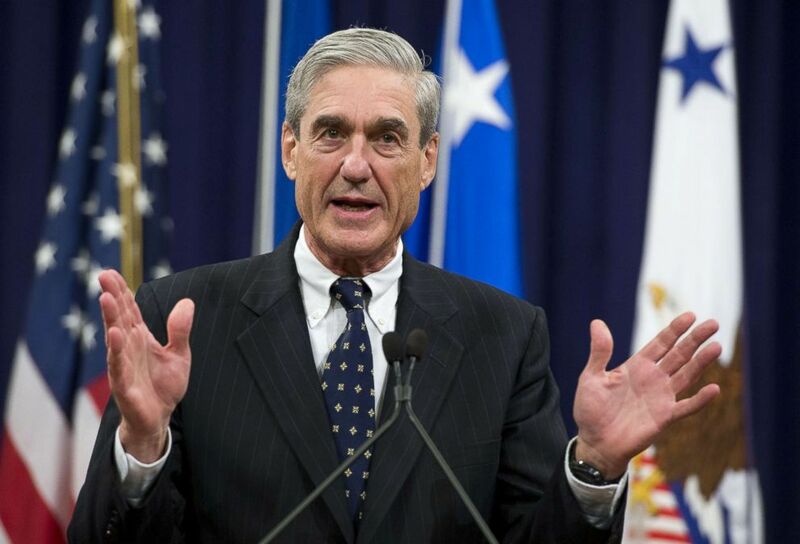 (Saul Loeb/AFP/Getty Images) FBI Director Robert Mueller speaks during a farewell ceremony in Mueller's honor at the Department of Justice, Aug. 1, 2013. One indication that the Mueller team remains interested in Stone is a December request investigators made to the House Intelligence Committee for a copy of the transcript of a 2017 congressional interview with Stone. The committee voted in December to share the transcript with Mueller's team. Stone said the referral of the transcript "is the result of a relentless and insidious campaign of distortion and disinformation by" congressional Democrats. Another sign the probe is still active came Friday. A grand jury convened in Washington to hear testimony from Mueller's team was scheduled to complete its designated term over the weekend, but it didn't. A court spokesperson confirmed Friday that the jurors' term had been extended for up to six more months. While their work continues, the Mueller team has been in appeals court seeking an appearance from one of Stone's former aides, Andrew Miller. The 34-year-old former scheduler for Stone -- who also handled some of his computer work -- has gone to court to fight the Mueller subpoena. And experts told ABC News that case may be a factor in explaining the possible delay in charges from Mueller against Stone. In November, a panel of federal judges on the D.C. Circuit Court of Appeals heard arguments on the matter. The appeal, which challenges the constitutionality of Mueller's appointment, is being steered by the National Legal and Policy Center, a well-funded conservative legal group with a deep history of mounting legal challenges against left-leaning organizations and Democratic politicians. Miller's attorney, Paul Kamenar, has pledged to take the fight to the Supreme Court if necessary. 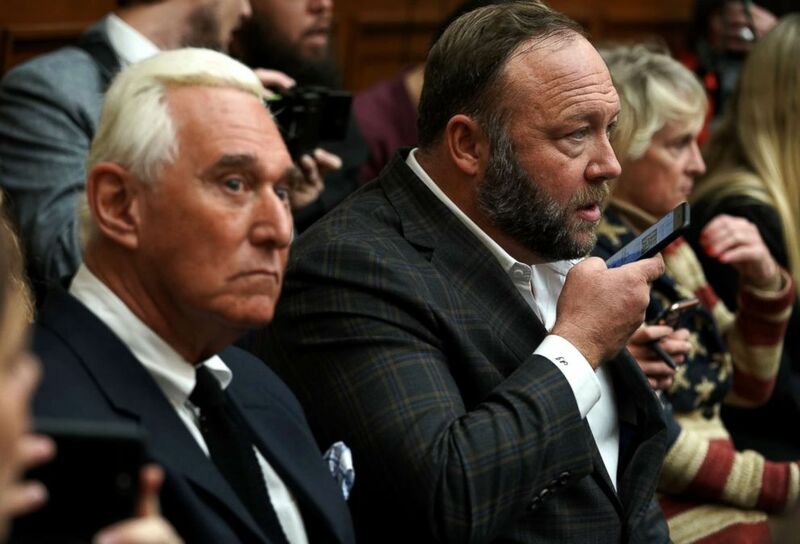 (Alex Wong/Getty Images) Political strategist Roger Stone and Alex Jones of Infowars attend the testimony of Google CEO Sundar Pichai at the Rayburn House Office Building on Dec. 11, 2018 in Washington. At the same time, a different case, which may be tied to the Mueller probe, also is headed to the Supreme Court. A fight over a second grand jury subpoena has wound its way through the federal courts. It garnered an emergency ruling from Chief Justice John Roberts just before Christmas, indicating the court plans to hear it. The defendant, an unnamed company owned by an unidentified foreign government known as Country A in court documents, has moved to avoid complying with a grand jury subpoena "because it would require the Corporation to violate Country A's domestic law," according to a court filing issued by an appeals court in December. The Supreme Court will now decide whether to maintain a freeze on mounting daily financial penalties imposed by the district court judge on the company for refusing to comply with the grand jury subpoena. Because the entire matter is shrouded in secrecy, there's no way to know if that case also may be a factor in delays to the Stone matter. Renato Mariotti, a former U.S. district attorney now in private practice, told ABC News he does not believe Stone is in the clear. "I would say one of two things is happening," Mariotti said. “One is, Mueller is gathering additional evidence to strengthen his case against Stone." Mueller still may harbor concerns that the evidence is insufficient to prove any case against Stone, or he may wish to strengthen his case before he brings any indictment, he said. Or a second possibility, Mariotti said, is that Mueller has largely or completely finished evidence-gathering on Stone but is taking time to review and analyze it before drawing up charges. "What we know is that there's strong interest by Mueller's team, and substantial evidence, because it wouldn't be going on as long as it has," he said. "But these things take time. I think there is a misconception out there in the public about how long this takes. These investigations go on for years, so this is not at all unusual." Meanwhile, the political provocateur is working to capitalize on his time in legal limbo. Stone has continued to engage in public speaking opportunities and media interviews to make clear his position that he has broken no laws. And, if he is accused, he said he's been working to ensure he'll be able to afford mounting a defense. In December, Stone launched a fundraiser to cover his legal fees: Selling signed stones. On Monday, Stone told ABC News doing so had netted him $12,895. ABC News couldn't independently confirm that figure.